Book hotel rooms online with us at Crowne Plaza Vilamoura Hotel at the lowest rate, guaranteed. 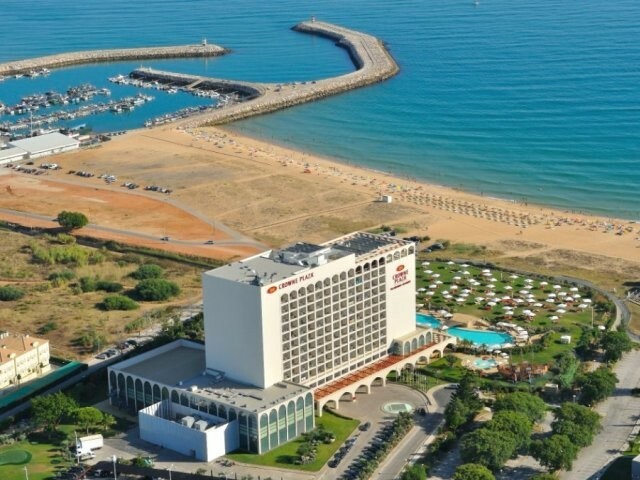 Get a holiday discount room rate at the 5 Star Hotel Crowne Plaza Vilamoura next to and facing the beach in Vilamoura in the Algarve. Most of the Hotel bedrooms have an excellent view of the ocean with furnished balconies. The 327 bedrooms are very comfortable furnished with air-conditioning and all the luxuries to be expected of a 5 Star Hotel, each with cable TV and coffee making facilities. Bedrooms range from doubles with facilities for one child to a family suite that caters for four adults plus 2 children. There are also facilities for disabled guests. Hotel Crowne Plaza Vilamoura in the Algarve has the Almond Tree Spa with treatments and massages, a Fitness Centre, a heated indoor pool, sauna, Jacuzzi and Turkish, the Cataplana Restaurant and Caravela Bar, games room, shops and library. The hotel outdoor pool has a large sun bathing terrace with a garden. A Peter Pan Kids Club provides snacks and a daily animated film. The hotel has direct access to the beach and is within walking distance of the Casino and the Marina with its many shops and bars. A good location for golfers being only a few minutes drive from several championship golf courses. Wi-Fi is available.